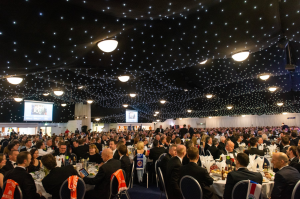 Home > KidsOut News > Leeds Gala Dinner breaks records with £132,000 raised! 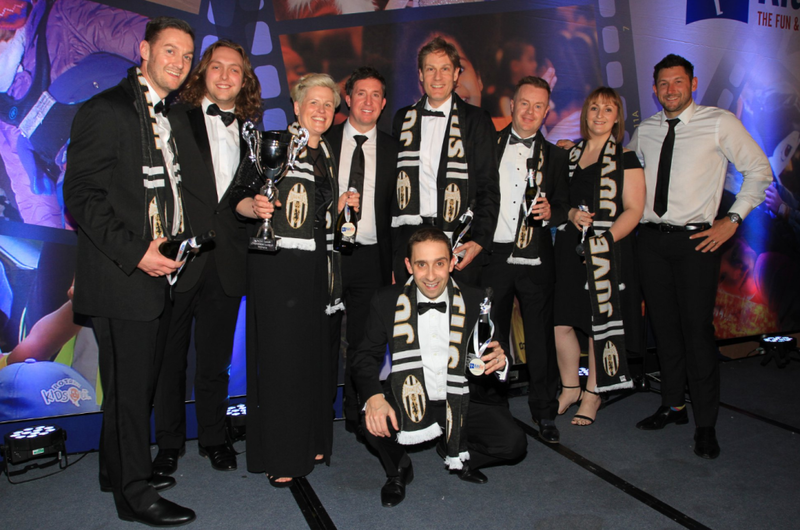 KidsOut’s 2019 Leeds Question of Sport Gala Dinner was a phenomenal success, raising a record-breaking £132,000 for the charity. This is £22,000 more than the 2018 Question of Sport, making this year’s Leeds Gala Dinner the most successful KidsOut black-tie event ever! 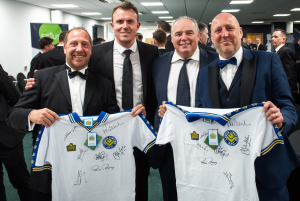 Over 800 people from Leeds-based companies joined KidsOut at Elland Road football stadium for a night of fun and fundraising on Thursday 28th March. 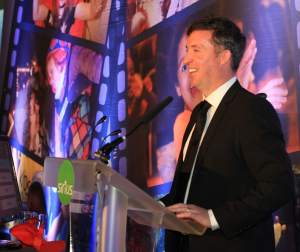 We were thrilled to have ex-Liverpool and England legend Robbie Fowler as quiz-master, while hosting duties were carried out by comedian and impressionist Mike Osman. Both hosts proved very popular with the guests! Winning the quiz and claiming the coveted Champions League trophy was Switalskis Solicitors, while Walker Ingram Associates finished the night with the Europa League Cup. Well-deserved victors! In addition to the main quiz, guests could also take part in a raffle and two auctions. There were some fantastic items up for grabs in the silent auction, including two Club Wembley tickets for England vs. Bulgaria and a range of stylish portraits of famous faces by esteemed artist Rob Bishop. Equally fantastic items were available in the main auction, such as an up to seven days stay at a luxury Costa Blanca apartment and a signed England 1998 shirt by Robbie Fowler. We are sure the winners and highest bidders of our raffle and auctions will enjoy their fabulous prizes. Those guests who purchased Platinum tables were able to attend KidsOut’s VIP Leeds Legends Panel. This exclusive panel of Leeds football heroes was made up of Eddie Gray, Paul Reaney, Mel Sterland, Steve Hodge, Simon Greyson, Allan Clarke, and Jon Newsome. Attendees had access to a rare Q&A session with the panel, while also having the chance to bid on exclusive signed football shirts and photo opportunities with the Legends. KidsOut would like to say a huge thank you to the rest the Gala’s event committee as well, as the Question of Sport event would not be possible without their help and support. The KidsOut team also wanted to thank the Sirius Group for being the event’s main sponsor. The money raised will be used as vital funds to continue to supply Fun Days and Toy Boxes to disadvantaged children in the Leeds area, helping KidsOut bring fun and happiness to even more disadvantaged children. A special shout-out is also warranted for the volunteers from Pinsent Masons, Gordon’s LLP, and Avant Homes. Their help on the night was essential in ensuring the event was a complete triumph. The date of the next KidsOut Leeds Question of Sport is 26th March 2020. Keep the date free in your calendars and be sure to stay up-to-date with our Facebook and Twitter pages for an official announcement soon.